AKIPRESS.COM - Probe into hooliganism, violation of public order was launched in Naryn following controversial conflict between local young persons and foreign students of the University of Central Asia (UCA), authorities said. Interior Ministry of Kyrgyzstan said that the incident in Naryn of June 8 is being treated as hooliganism. Collection of materials and other investigative actions are under way, the statement said. Additionally, the Interior Ministry's security service has launched internal investigation to evaluate the actions of the officers during the meeting. 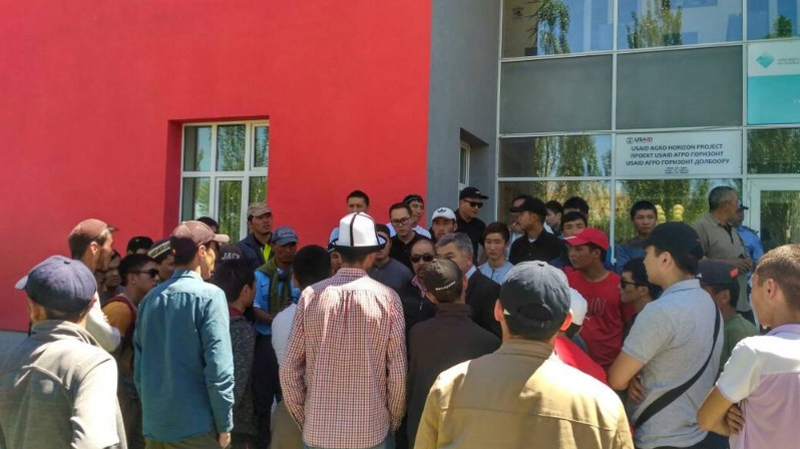 On June 8, dozens of young people in Naryn gathered for protests in front of the University demanding the authorities to step in the conflict that arouse after the Tajik students allegedly "beat up locals during the basketball match" at the UCA campus in Naryn on May 27. Angered Naryn youth made the UCA students and some professors to get down on their knees to apologize for a conflict sparking a nationwide controversy. The University of Central Asia (UCA) was founded in 2000. The UCA Naryn Campus launched in September 2016. The Presidents of Tajikistan, the Kyrgyz Republic, and Kazakhstan, and His Highness the Aga Khan signed the International Treaty and Charter establishing this secular and private University.